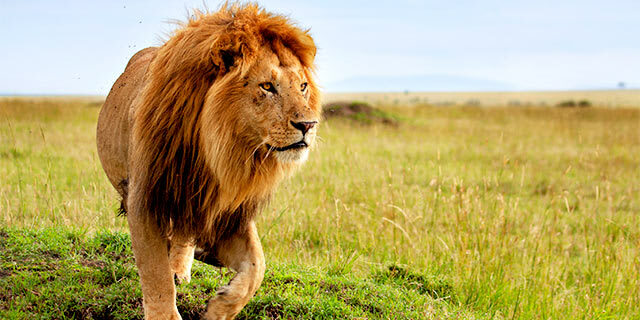 Once in your lifetime, go to Kenya – the country that perfected the safari! Awake to the sounds of bull elephants drinking from rushing rivers. Witness mass migrations of wildebeests. Ride a hot air balloon over the vast plains, watching breathtaking and diverse wildlife go about their days far below. the landscape is just as memorable (and photogenic!) 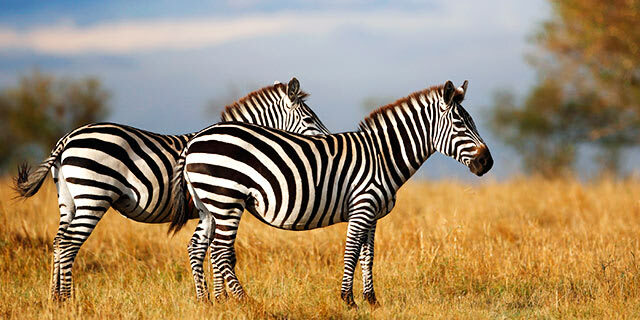 as the wildlife – from Kenya’s beautiful lakes, beaches, and sweeping panoramic plains. Kenyans say "Karibu" in welcome, with smiles as wide as the horizon. 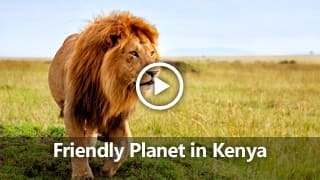 Embark on a Kenya Safari to experience what others refer to as the “classic safari experience.” Kenya is home to over 25,000 different animal species, including the Big Five, making it one of the world’s most biodiverse countries. Here among the grassy plains and lush landscape and with views of distant Mount Kenya, you'll find buffalo, elephants, antelope, abundant bird life such as ostriches, cranes and storks, and so much more. 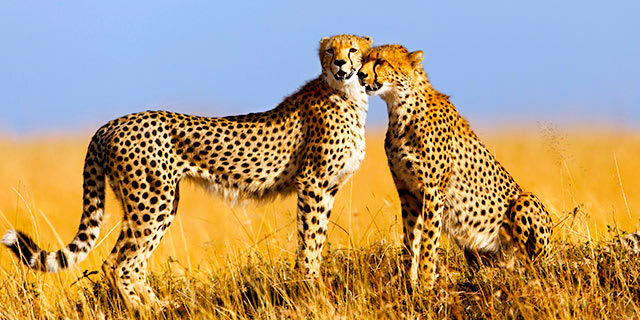 You might even catch a glimpse of the plain’s greatest predators – cheetahs, leopards, and lions! Nairobi is Kenya’s capital and the most cosmopolitan city in East Africa. The city reverberates to the uniquely Kenyan beat of nightlife music, clanking silverware in some of the continent’s best dining options, jovial conversation in the city’s green spaces, and of course, like all major cities, traffic! Nairobi is also home to Nairobi National Park, Kenya’s first national park and home to a large variety of Kenya’s iconic wildlife. The city also hosts several wildlife orphanage and rehabilitation centers for elephants, chimpanzees and the like. You can’t truly understand Kenya – its culture and its people – without spending at least a day in its capital. And then of course, you can’t truly spend a day in its capital, without sliding into a chair at the end of it and cracking open an ice cold Tusker, the country’s most popular beer. Every year, between June and September, millions of wildebeests, zebras, and antelope migrate in unity – looping between the Serengeti in Tanzania and the Masai Mara in Kenya. 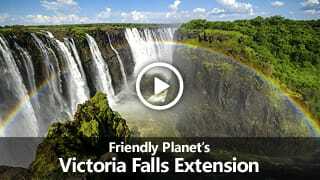 Their search for greener pastures and flowing water creates one of the greatest natural spectacles on the planet. In a never ending cycle the wildebeest birth 300,000 – 400,000 calves early in the year (Jan – Mar) and by April they set out from their home in the Serengeti. When September rolls around the massive herds arrive in Kenya and ready themselves for the journey’s peak: crossing the Mara River! This migration is truly one of the world’s greatest wildlife spectacles. Living among the plains in southern Kenya, the Masai Mara people have danced in these homelands for centuries. Prominently located along the African Great Lakes, the Masai speak the Maa language, which is common in several areas around the Nile River. 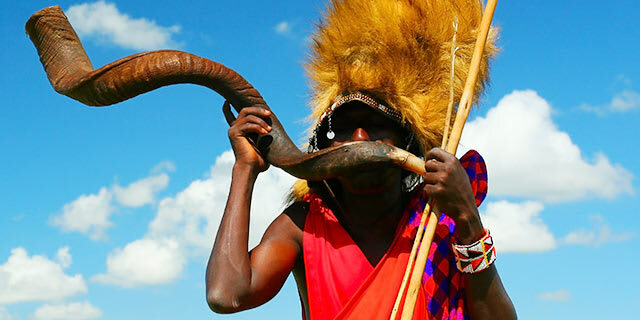 Famous for their music and dance – Masai ceremonies are a highlight of any visit to Kenya’s vast rural landscapes. Based on a call and response model the leader, or olaranyani, begins singing the melody and is joined by a chorus that vocalizes the rhythms with harmonies and typical throat singing. This polyphonic-like chant is an authentic, once in a lifetime experience! Already booked on one of our packages to Kenya? See everything you need to know before you go. The CDC recommends for anyone traveling to or coming from a yellow fever endemic country to take the Yellow Fever vaccine prior to travel. Yellow fever is a risk in certain parts of Kenya, so vaccination against yellow fever is recommended for travelers to these areas. In addition, if you have recently traveled to a Yellow Fever Endemic Country, you must show proof of yellow fever vaccination for entry into Kenya and/or another country (such as Tanzania, for example). Find a local vaccination center. Travelers may be denied entry for not having sufficient proof of immunization. An exemption may be granted under certain medical circumstances, so be sure to discuss this issue with your physician. According to the WHO, malaria risk exists throughout the year in the whole country. There is normally little risk in the city of Nairobi and in the highlands (above 2500 m) of Central, Eastern, Nyanza, Rift Valley and Western provinces. Please consult with your personal physician or local public health authorities regarding taking anti-malaria pills. Consult your doctor about taking additional vaccinations for polio, typhoid, and hepatitis. With the exception of the months of April and May, which are very wet, Kenya is a year-round destination. Most of Kenya is at higher elevations which alleviates the heat. Generally speaking, the weather is temperate with average daytime temperatures in the 60's-80's. However, in higher elevations you may experience cooler temperatures. In the arid, desert- like region of Samburu National Park, temperatures may be hotter. We suggest bringing clothes made of cotton, preferably in neutral colors (especially for game drives). A hat, scarf, sunscreen and insect repellent are also valuable accessories for your trip. If you have two pairs of comfortable (broken in, not brand new) walking shoes, by all means, take both pairs. Since weather can be unpredictable anywhere in the world and to be sure you are comfortable during your trip and prepared for all types of weather possibilities, we recommend that you carry a small folding umbrella (or poncho) and take with you a light jacket or sweater. Packing to dress in layers is the best way to prepare for a variety of weather conditions. Finally, remember that the countries visited on this tour are casual, and comfort should dictate your wardrobe for the tour. Binoculars are also suggested. The local currency in Kenya is the Kenyan shilling. Hotels and some stores accept major credit cards. However, for "street shopping" you will need local currency. Your hotel will be able to exchange your cash to local currency. Credit cards are the most convenient way to pay for items you purchase as you travel. Be sure to call your credit card providers to let them know you will be traveling abroad, the places you’ll be visiting and the dates of your trip. This is important for your own protection. We suggest that you bring along cash in small denominations and we highly recommended that you bring crisp, new bills. If you wish to exchange U.S. dollars to the local currency, new, crisp U.S. dollar in large bills ($20, $50, $100) are preferred. Old, torn, crumpled bills & US dollars printed 2000 or earlier are not accepted in East Africa. Travelers’ checks are not accepted in Kenya. Shop for wood carvings of animals and people, sisal baskets, Masai and Kikuyu beadwork, hand-woven sarong fabric, soapstone, gourds, ebony carvings, batik wall hangings, tanzanite gemstones, and malachite. Some of the best handcrafts of Kenya and other countries in Africa are sent to Nairobi. Visit artist cooperatives to buy directly from artists. While we take great care in arranging the components of your tour, we have no relationship with the shopping venues you’ll encounter, and we cannot be liable for any purchases you make. Please keep in mind that many, if not most stores outside the U.S. will not allow exchanges or refunds for your purchased items. Cash may be the only form of payment accepted for shopping in Kenya, particularly throughout the Masai Mara and at the Masai Village. There have been problems with not receiving souvenirs shipped home, so we advise that you carry them home in your luggage. Please Note: Strict conservation laws in Kenya make it illegal to purchase coral, shells, ivory, or the skins of endangered species. The penalties for trying to transport or smuggle these items out of the country may be severe. Tips for Bargaining: Bargaining is a way of life in Kenya. If you want to purchase something, and you think the price you’ve been quoted is too high, thank the vendor and walk away. Generally, he/she will come after you with a lower price. It is usually considered good bargaining policy to offer half the asking price, and negotiate from there. But the negotiations should be done in a respectful way. Kindly note that most hotel shops maintain fixed prices. 240 volts. Plug G. You will need a voltage converter and plug adapter in order to use U.S. appliances. We recommend getting a universal adapter and converter kit. View more information about electrical standards around the world. Cameras and video recorders are permitted, and photography is generally permitted everywhere except at airports and military installations. It is always polite to ask before taking a picture of a person. Memory cards for digital cameras will be available in major cities. I heard Kenya has banned plastic bags? Check out our blog for our latest articles on Kenya.